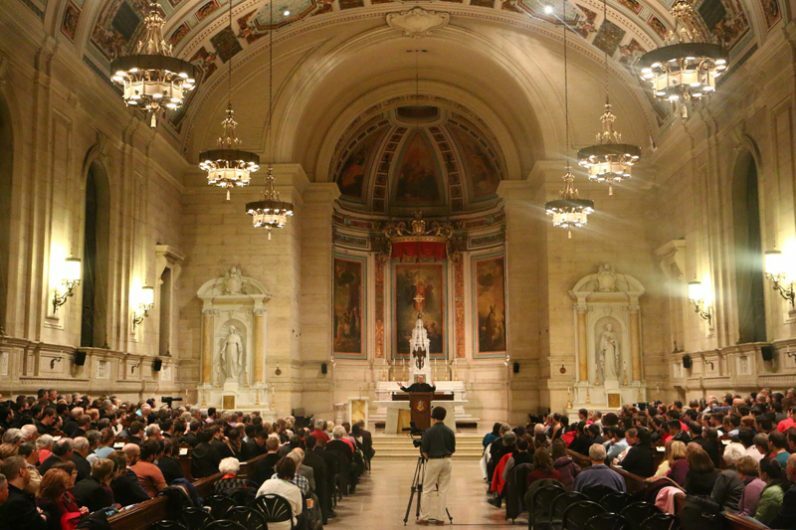 Judging by the capacity crowd of some 400 people “and the 500 people we needed to turn away, I’m not sure we need to introduce tonight’s speaker,” said Oblate Father Thomas F. Dailey, addressing a packed audience Monday evening, Jan. 29 in St. Martin’s Chapel at St. Charles Borromeo Seminary in Wynnewood. 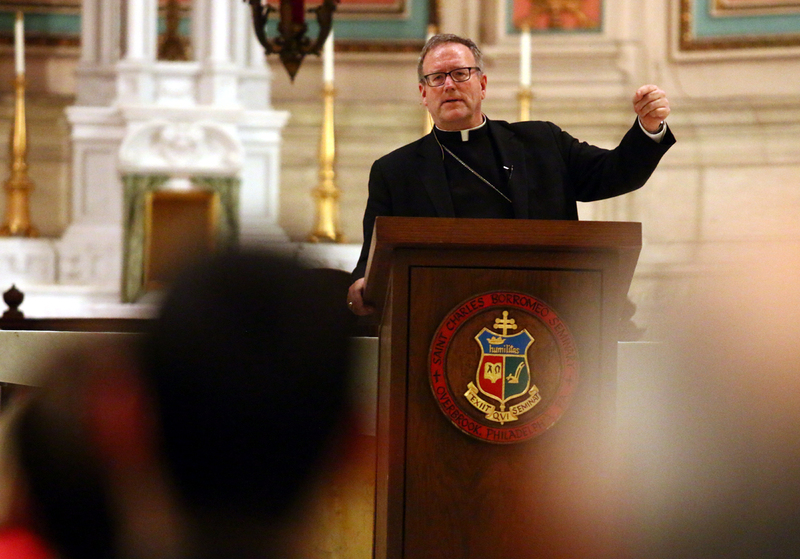 As the current John Cardinal Foley Chair for Homiletics and Social Communications at the seminary, Father Dailey was introducing Los Angeles Auxiliary Bishop Robert Barron for an hour-long talk on Catholic evangelization today. A popular theologian, author, founder of Word on Fire Catholic Ministries, Chicago priest and host of the documentary film series “Catholicism,” Bishop Barron has over 1.5 million “Likes” on Facebook and chairs the United States Conference of Catholic Bishops’ Committee on Evangelization and Catechesis. “You probably already know that, which is why you’re here,” quipped Father Dailey. Bishop Barron was invited as the featured speaker of this year’s John Cardinal Foley Lecture Series, now in its fifth year. Named for the late Delaware County native, Philadelphia priest and longtime narrator of the pope’s Christmas Eve Mass from the Vatican, the lecture series and endowed chair at the seminary honor his legacy and ministry by inviting prominent leaders in communications to address current topics. The cardinal was president of the Pontifical Council for Social Communications for almost a quarter-century after serving as the editor of CatholicPhilly.com’s newsprint predecessor, The Catholic Standard and Times, and a professor and resident at St. Charles Seminary. Bishop Barron’s topic was titled “Word on Fire: A Story of Evangelization for the Digital Age.” Although his talk ostensibly was directed to the seminarians, the crowd came from all over, and early. The line into St. Martin’s snaked past the long refectory corridor and into the main entrance of the College Division as early as an hour and a half before Bishop Barron’s talk was scheduled to begin. Saying he wanted “to cull or distill some truths that have governed the development of the Word on Fire story,” he was responding to Archbishop Chaput’s encouragement for him to address the practical issues of the formation of his global media ministry. Bishop Barron covered four phases of that development from Word on Fire’s genesis as a 5 a.m. Sunday Chicago radio homily — whose audience was made up of truck drivers — to the beauty-first bastion of Catholic pride it is today. Along the way he summed up his lessons in little snippets: “Evangelization requires an evangelist,” summing up the need for an effective “front man” and a “voice;” balanced with “Keep it Christocentric,” addressing why he never named it “Robert Barron Ministries” but kept the focus on Christ and the Word. Some of his advice was also surprising. Many seminarians he has encountered want advice on what to do with evangelization and getting involved in media. His response? “Read! Read books! Like, long complicated books,” he said, adding that a deeply read priest could draw from the wellspring of the church’s best offerings. Perhaps the biggest challenge for evangelization, Bishop Barron said, is seeking funds for good media projects. But if the project “is of the Spirit,” said the bishop, citing the passage in Luke’s Gospel when Simon Peter’s catch of fish overwhelms the boat, “other boats show up” to help in the work. Following the advice of his mentor, Cardinal Francis George, the late Archbishop of Chicago, Bishop Barron eschewed the language of the culture warrior: “You cannot evangelize a culture if you don’t love it first,” he said. He urged “leading with the beautiful” and going out to meet the world “with fife and drum,” confident of the truth that the church draws from, but communicating it with great love. The talk with its clear organization and use of humorous anecdotes made a deep impression on those who heard it. Fleck said he and his classmates planned to draw practical tips from the series’ talks for homilies they will preach someday. He already live streams Masses from his parish and has an active online parish ministry. “Lots of people in our parish actually ‘lurked’ at Masses online before coming to church in person,” Father Walsh said. The address on evangelization using new media was appropriately streamed live through the seminary’s and Word on Fire’s Facebook pages. I hope they gave Bishop Barron a green Eagles football jersey for his trip back to Los Angeles Diocese. As a former seminarian at St. Charles (1950 to 1957), I am disappointed that we never receive advance notification of these types of activities. On another note, I have been told that the seminary property has been sold, and the seminarians moved to Bishop Newman college. What is the actual status of this situation?